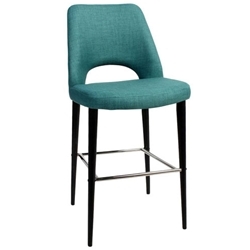 Features: Modern design Bar Stool for Domestic and Commercial applications. Colours: Stocked in 3 Fabric colours Ash Grey, Charcoal and Teal along with Black and Charcoal in our Heavy duty Commercial Vinyl range. Other colours available on Indent order and subject to factory MOQ. Frame: 2 Steel frame finishes available Natural and Black Powder coat options. Leg design is tapered. 2 seat heights available Kitchen 650mm and Bar at 750mm.